Jet vac tanker driver Simon Rouse values the team spirit, sense of achievement, and the can-do approach to working at Lanes Group plc – all attributes he associates with his service in the Royal Navy. Simon, aged 57, has been as a jet vac operator at the Lanes Eastleigh depot since August 2015 – the latest step in a career and life so nearly cut short during one of the most famous military conflicts of the late 20th Century. He had been serving as a 22-year-old sonar technician on destroyer HMS Coventry when it was bombed and sunk during the Falklands War in 1982. Simon was injured and only just managed to escape he spent 40 minutes in the freezing waters of the South Atlantic tied to the outside of one of the few usable life rafts before being rescued. Nineteen of his comrades were killed and 42 were injured. He says: “The Argentinian air force targeted us HMS Coventry on their national day, the 25th of May, because we were very successful in shooting down 11 of their planes, two helicopters, and sinking one of their patrol vessels. Simon was later diagnosed with post-traumatic stress disorder (PTSD), a condition he still has to manage, but has gone on to enjoy a full and varied career. He worked for many years in the North Sea and around the world being trained in diving and acoustics he became a remotely-operated underwater vehicle (ROV) operator. The onset of ill-health, and a diagnosis of heart failure, resulted in him fitted with a heart pacemaker in 2001. It ended his career in the oil industry, because he could no longer fly in helicopters to get to deep-sea rigs because of the amount of medication he had to take. Simon, then worked buying and selling luxury boats, and then as managing director of his security company, providing guards for a major cross channel ferry company and Premiership football clubs. He then joined BAE Systems as part of a small team managing safe entry into confined spaces for its work force on the project to build two aircraft carriers, Britain’s biggest ever warships. In 2014, he was made redundant, along with 3,000 other workers, with BAE Systems blaming cuts in defence spending. At this point, Simon chose a different career path. Simon chose to train as an HGV 1 and HGV 2 driver. 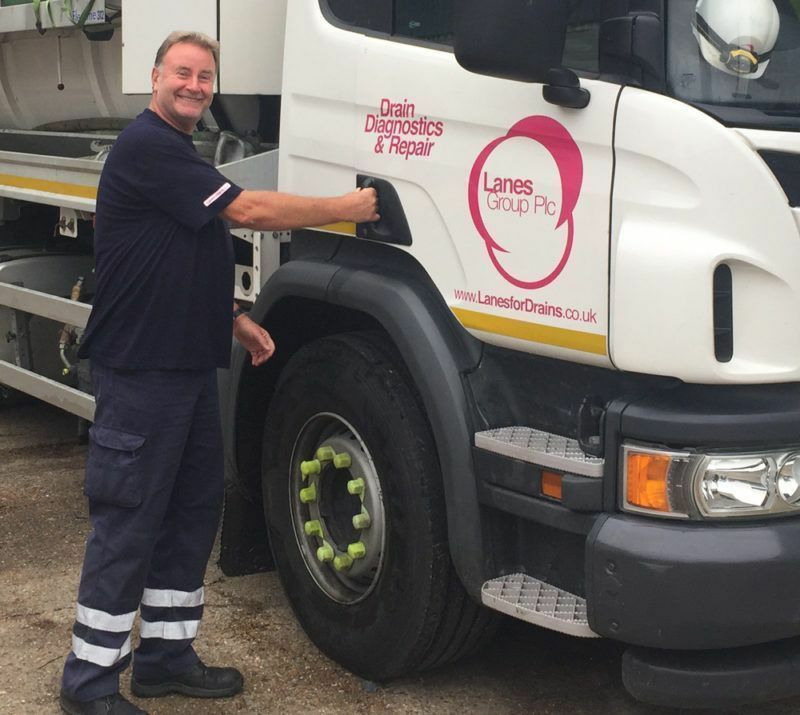 After passing his tests, he joined an HGV driver’s agency, and did some jobs for it, but then he applied to Lanes Group to become a jet vac tanker driver/operator. He says: “It looked like an interesting job, and a bit of a challenge, and I liked the way it involved learning some additional technical skills, rather than just driving around all day. Simon is now fitted with a bi-ventricular pacemaker. Without it his condition, heart failure, would kill him. He must also take 13 pills every day. However, that does not stop him working at Lanes. “I am still fit and capable enough to do my job and well managed by my hospital,” says Simon. “The hardest part is lifting some manholes. But, if need be, I have colleagues who can help me. And safety rules mean we shouldn’t strain to do heavy lifting anyway. Simon would recommend that other HGV drivers consider a career at Lanes. “If you want to do something that’s more than just routine, that makes a difference, and gives you extra technical skills and qualifications, it could well be a good choice,” he says.